If your first thought is "let's train business users to use Hive, Pig, and Spark!" don't be surprised when everyone rolls on the floor, laughing. If your second thought is “we need BI-in-Hadoop software,” you’re still missing the boat. BI-in-Hadoop was kind of cool in 2011, but it’s a trap today. “BI-in-Hadoop” software is less mature than traditional enterprise BI software, and it lacks many of the features users consider essential. End users must switch tools to work with data in Hadoop. To your executive team, it’s YABIT: Yet Another BI Tool. It will take considerable time to drive value. Just selecting a new tool will take months. On average, it takes 73 business days to go live with a new BI tool. Since “BI-in-Hadoop" tools are less mature than leading tools, your experience could be much worse. The result of your efforts will be another BI silo. That's not smart. The bottom line: BI-in-Hadoop is dead. Your business users like to work with Tableau, Excel, PowerBI, Qlik and other BI tools because they http://www.tableau.com/ easy to use and deliver the analytics they need. If your organization has standardized already on one or two BI platforms, that is a significant investment: training and mentoring users, as well as developing the IT skills to support and manage the software. Instead of forcing your business users to learn new software when they use Big Data platforms, empower your business users to work with any data, of any size and type, in any data platform, at top speed, and under enterprise governance standards – with the BI software they already know and like. We call this approach BI-Everywhere. Decouple end user tools and data platforms. Push workload into the data platform. Where possible, leverage open source query engines. Support BI across modern Big Data platforms. Preserve existing BI capabilities. 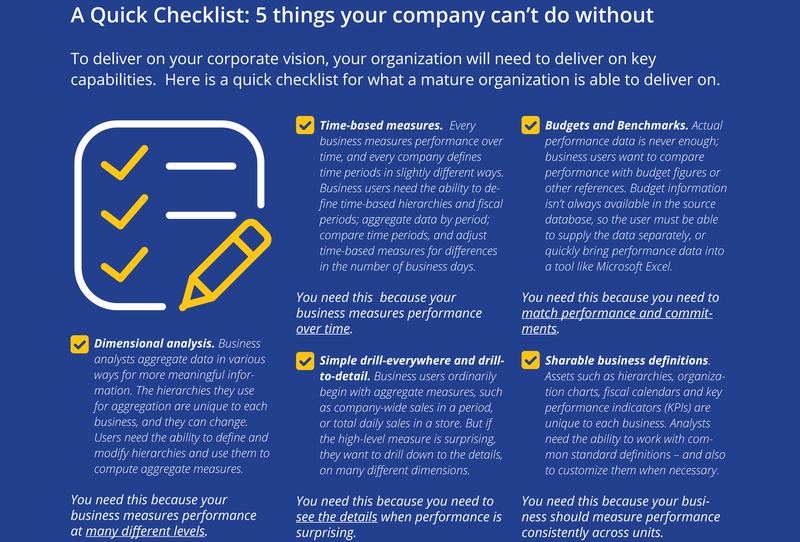 BI based on these principles conserves your existing investments in software and radically reduces time to value. Your team spends less time evaluating and selecting software; building new data feeds; training, mentoring and coaching end users; and rebuilding BI assets from scratch. About The Author: Thomas Dinsmore, author of Disruptive Analytics: Charting Your Strategy for Next-Generation Business Analytics, has more than 30 years proven experience in the field, working with more than 500 clients, across a diverse cross section of vertical markets ranging from global finance to retail. As an independent consultant Mr. Dinsmore provides insights into the machine learning market for businesses and investors. Thomas has been working with BI, Big Data and Analytics since earning his MBA through The Wharton School in Accounting and Decision Sciences.